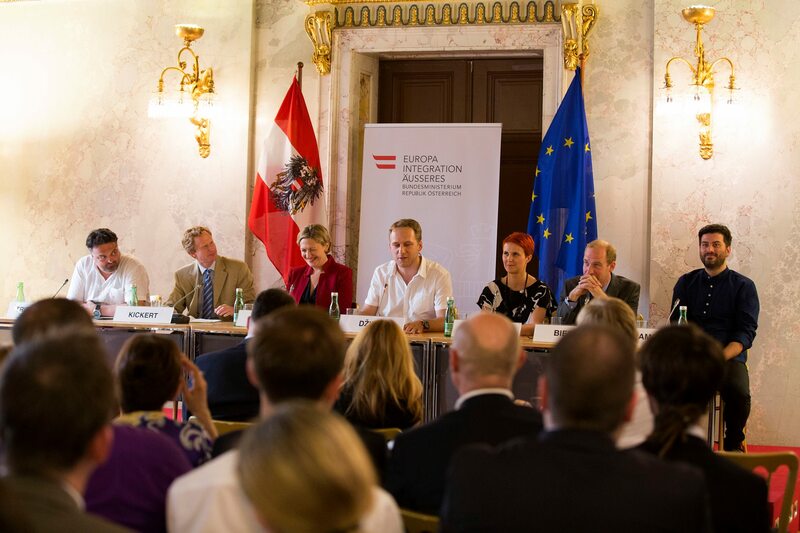 I had the pleasure to be part of a panel debate yesterday at the foreign ministry in Vienna on civil society. More meaningful than just “another” panel on Bosnia was the fact that it took place at the foreign ministry and was opened by Austria’s foreign minister and included also the head of the EU delegation Sörensen in Bosnia. On the other hand,it included no politicians from Bosnia and this was no coincidence. The message of the panel and the high level engagement by Austria and the EU is that it is no longer enough to talk with the political elites, but rather civil society needs to be engaged. This is a refreshing change from an approach that focuses mostly on the leaders of the main political parties. Similarly, the panel was less about formal and established civil society organizations, but rather activists, two from plena (Ajda Sejdić and Amna Popovac), musician Damir Imamović and Aleksandar Trifunović of independent media platform Buka. The panel was a useful reminder that civil society is more than NGOs and not just there to providing technical expertise, but articulating voices from society. The result was a refreshing debate. Yes, the problems are old and there is little disagreement about the responsibility of political elites. Little attention centered on the constitution and the Sejdić-Finci cases, but as the February protests highlighted, the main issues are poverty, economic mismanagement and corruption. As Damir Imamović noted, these grievances highlight that Bosnia’s problems are not fundamentally different from elsewhere. Yes, they express themselves differently or are compounded by the government structures, but they are not exotic and do not make the Balkans and Bosnia exceptional. The key question to which there is no clear answer, is how to achieve change. It seemed clear that the plena have mostly run their course. While they have helped generate ideas and continue to operate, they themselves will not generate change in Bosnia. Yet, as in other countries, protests often require multiple waves and different forms until they become successful. While some politicians resigned and some small legal changes were made, the main success of the protests and plena was not the number of political demands fulfilled, but rather showing the possibility of citizens to organize outside the formal structures and, if briefly, giving the political elite a real scare. There was a clear sense at the discussion that there is no need for new political parties to achieve change. In essence, the choice is between new political actors emerging within the structures or, I argued, in the ability of the EU and civil society to change the behavior of political elites in power. In fact, nationalist and reluctant reforms from Ivo Sanader, Milo Djukanović and Ivica Dačić or Aleksandar Vučić have been able to switch their political priorities. This was usually based on a rational calculation based on changing demand from below (for EU integration) and pressure from outside. The key question remains on how to change the incentive structure for Bosnian political elites. The panel suggest that some EU member states and the EU start realizing that the transformative effect of the EU accession depends on allies within the country that scrutinize political elites and thus point out the discrepancy between the talk of EU integration in the country and the reality. However, this dynamic can only become effective if the prospect for EU membership remains real and the support for civil society becomes sustained and extends beyond a few high-level events.